Currently, no popular browsers support SOCKS proxies with authentication. 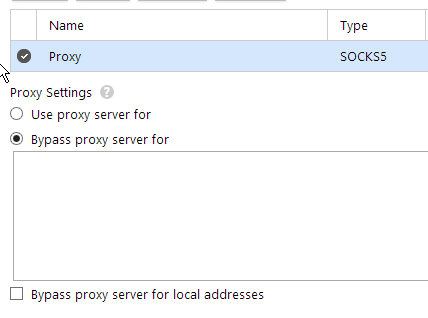 Even browser extensions fail to properly authenticate the proxies, so we’re going to show you how to use your private SOCKS4/5 proxy with a web browser that we highly recommend. 2) Use Maxthon browser, the easiest to use authenticated proxies on. We’ll go ahead and show you how to use an authentication proxy on Maxthon browser first, since it’s much easier. Once it’s installed, go to the settings page of the browser. Click the “Add” button and enter your proxy details and confirm the type and press “OK.” It’s helpful to know that the default port and username for a SOCKS proxy are 1080 and root, respectively. Make sure under the settings, you enable using the proxy by default by selecting “Bypass proxy server for” which will tell Maxthon to use it for all websites other than the ones you list, rather than the other way around. Second, as we mentioned, you may enable IP authentication instead of username and password for your proxy. This is for advanced users as you must edit your settings on the proxy server. For our guide, we will be showing you how to edit this for a Dante proxy server and Ubuntu/Debian. Make sure all other traffic is blocked properly. Restart your server/reboot your server for the changes to be reflected. If you don’t already have a private SOCKS proxy, you can purchase one that’s already set up from us. Please keep in mind the proxy will not hide your IP on Java applications or other plugins within Maxthon. Java has separate settings.